The Ward County Reporter began as the Burlington Reporter but moved to Minot with a new name but the same owner, J. L. Colton, who then sold it to C. A. Johnson. Johnson himself sold the paper in 1897. George W. Wilson owned the newspaper from 1897 to 1906 and sold it to Sam H. Clark who owned it from 1906 to 1912. Both of these men were politically active, Clark being elected a Minot mayor; outspoken, and intensely interested in local affairs. C. A. Johnson re-purchased the Ward County Reporter in 1912 and owned it until 1916. This publication eventually became The Ward County Independent located on the west side of 1st street next to the American Legion. Two doors north was Harry's Tire Service. During the 20s and until the 50s the paper and printing business were owned by Mr. Glen D. Colcord and Earl C. Fuller. W.H Fuller was owner publisher from 50s until it closed in the mid 60s. It was a weekly paper and job printing business housed on three floors of the building. Huge press in the basement for the newspaper run and book binding work. 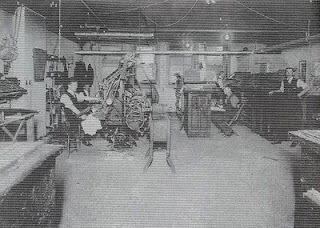 Main floor were offices and behind the Linotype machines and smaller presses. Offices on upper balcony. I can still remember the smell of printer's ink when I walked in the front door.